I'm a huge fan of buffalo chicken dip, but between the cream cheese, ranch dressing, cheese and dipping chips- the fat content quickly soars through the roof. I have managed to make this recipe low fat, low carb, but not at ALL low in flavor! 1) Cook chicken with garlic & onion powder- I choose to broil because it makes it SO flavorful. Boiling/baking will work too. Then shred the chicken. 2) While chicken is cooking- combine the remaining ingredients into a sauce. Add shredded chicken, stir to coat. 3) Serve over favorite shredded lettuce/spinach. 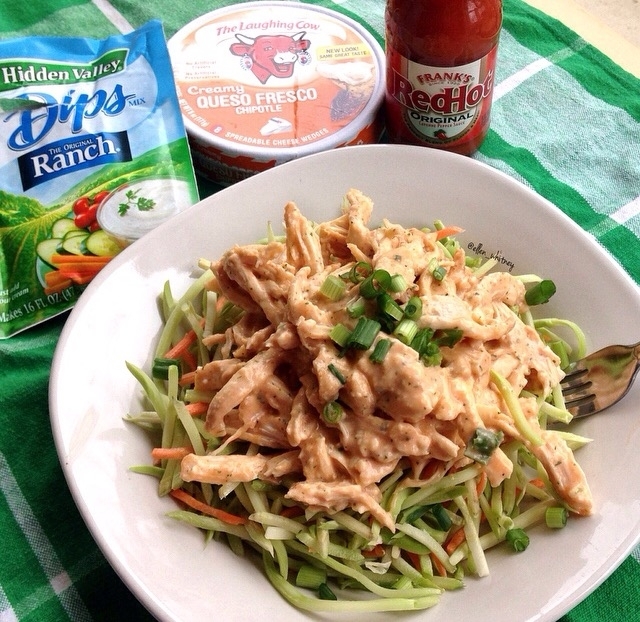 I served mine here with broccoli slaw, as I found serving it over slaw gives you all the buffalo dip flavor & still the "crunch" of eating with chips. If you don't want eat as a salad, slice up your favorite high fiber tortilla, bake a couple minutes and voila- instant chips. Garnish with green onion.